These notes relate to the stopping positions within the Prezi presentation above. Business models can be used with before/after NBN changes, Mobile customer changes, Bring Your Own Devices changes etc. Your Business Model is often in your head. Business and Information Communication Technology (ICT) should be considered for a business model. Include what you have and want on the same business model. Design a startup. Business Model design is part of Startup Weekend. Improve your business. Better stakeholder understanding. Improve your customers businesses. Value add with a customer business model creation. Business Model yourself, small business, department or organisation. Have you recorded your business model? Can business be improved from your existing business model? On a Business Model Canvas, customer front end is on right , value propostion is in the middle, business back end is on left. One diagram showing how you business operates for stakeholders. Who are your customers? How do you help them? New SME/customer/competition business models may affect your business. Business Model for multiple customer segments. e.g. Retail, Wholesale, Online, Corporate, Government. Can you use business model differently? Customer activities versus matching business activities. Define your customer segments in customer value terms. Match your value proposition to what matters most to the customer. This is an ICT Industry value add. See how multinational companies apply modern business models. Combine multiple styles for extra business performance. These model styles can relate to the ICT industry. Many more models exist. Borrow models from other industries. Model what you have and want. Build a project schedule to move forward. Model your customer business which includes your products/services in their desires list. Model online with ~ 90% of the business + technology answers provided. Enter a Model name and select what you have and want. 200+ attributes to choose from plus add your own unique attributes. Click Create Business Model with your attributes and export as text and/or a graphic. Validate, try new attributes and refine your new business model for sustainability and growth. 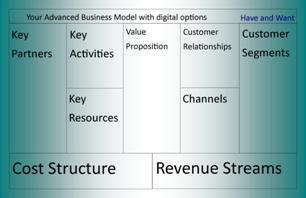 Business Model FAQ, 4 Industry Examples, Business Model Creator & Model Definitions on website. Time to make your own business model. You and NBN at the next level 74 ideas for high speed broadband. Skills Framework Information Age assessment Which skills do you have or need for your business model? * Consider the networking and Internet speed requirements for a changed Business Model.